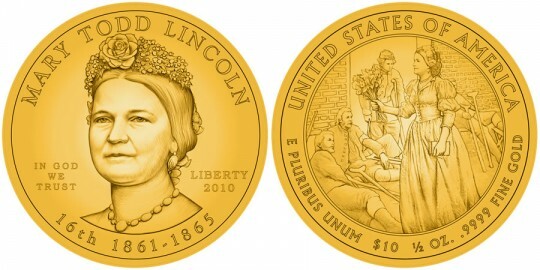 The Mary Todd Lincoln First Spouse Gold Coin in proof condition is the last of four First Spouse coins that will be issued in 2010. It also marks the 17th for the series as a whole since it started in 2007. Mary would prove to be a loving and supportive wife of Abraham Lincoln long before his election to the Presidency. Even with the loss of a son, she still pushed him to pursue his political dreams. However, their time in the White House could hardly be considered merry. After all, it was during the American Civil War. Also, the couple lost another son while there. Still, Mary was seen as compassionate and even took the time to visit wounded union soldiers. However, after witnessing the assassination of her husband, Mary would spend the rest of her life in mourning. These Mary Todd Lincoln coins are struck from 1/2 ounce of 24-karat gold and are limited to a maximum mintage of 40,000 across all product options. The Lincoln coin is also available in an uncirculated version. Phebe Hemphill designed the portrait of Mary Lincoln that is featured on the obverse. We also see the words "MARY TODD LINCOLN," "IN GOD WE TRUST", "LIBERTY", "2010", "16th" and "1861-1865". Mary is shown delivering flowers and books to wounded union solders on the reverse of her coin. It was designed by Joel Iskowitz and sculpted by Phebe Hemphill. Also shown are the words "UNITED STATES OF AMERICA", "E PLURIBUS UNUM", "$10", "1/2 OZ. ", and ".9999 PURE GOLD".